I can’t say much with authority in life, but today I will say this: putting together an 8-drawer dresser from Ikea is a suckbox of an activity. It takes, on average, at least two days and as much sanity as you have on hand. True, it probably would have been an easier task had the instructions not been missing and had all of the parts been in tact, but still. Just part of the experience, amiright? Thanks, Ikea. Your cheap furniture may or may not be worth the subsequent years you took off my life this weekend. In other news, I’m feeling fairly dramatic today. 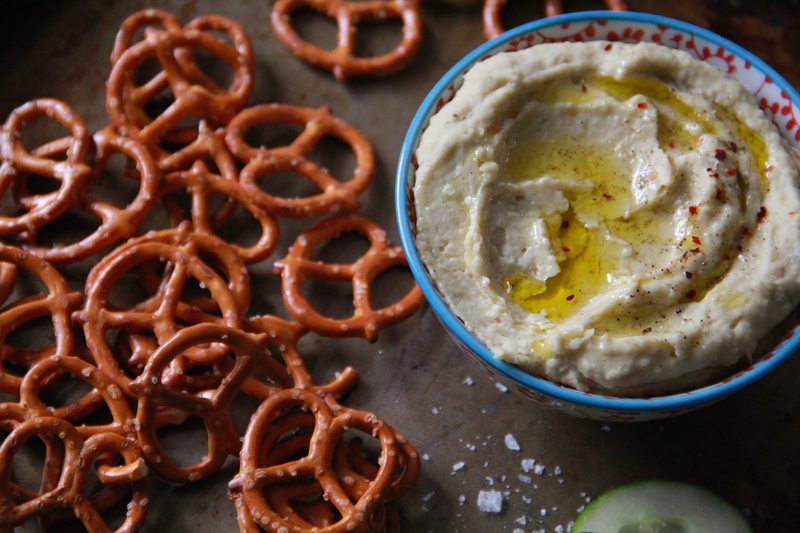 Let’s talk about hummus! It’s a staple in our fridge, and though I’ve made my own a few times, I usually just buck up and buy it when I’m out grocery shopping. There are a few really great brands out there, and hauling out the food processor every few days to make a new batch is kind of a daunting prospect, so. Sabra it is! I love the dense creaminess that white beans bring to the table here. They’re dreamy paired with rich (but light) whipped avocado, fresh lemon juice and punchy herbs and spice. 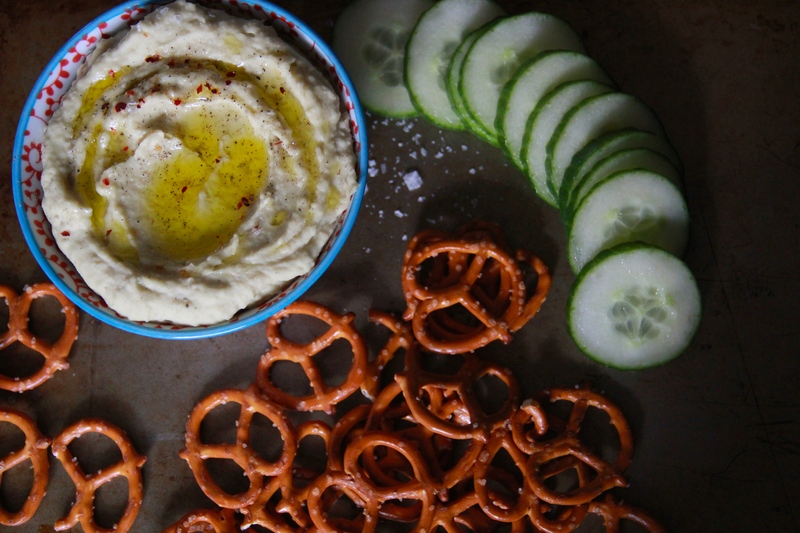 It’s great in any kind of hummus application — spread on crackers or sandwiches, or used as a dip for fresh veggies, pretzels and chips. You’ll need a food processor or high-powered blender to get a supremely smooth, creamy hummus, but don’t be daunted– I know for a fact that cleaning these appliances, while not the most fun, is at least 15 times more enjoyable than assembling something — anything, really — from Ikea. If you’d rather not bother with dried beans, feel free to substitute canned, instead (just rinse and drain them well). In a large container, cover the dried beans with 4-5 inches of water. Toss any floaters, cover the container, and allow the beans to soak in the refrigerator overnight. Drain the beans, place them in a large pot, and cover them with a fresh 3-4 inches of water. Toss in the rosemary sprigs, sage leaves, salt and pepper. Bring the pot to a boil, then lower the heat and simmer the beans until tender, 45 minutes to an hour. Drain the beans (remove and discard the tough rosemary stem, if you can find it) and place them (with the stewed herbs) in a food processor or powerful blender. Drizzle the beans with olive oil, top with avocado, lemon juice and red pepper flakes, and process until very smooth. Taste the hummus, and season to your liking with extra salt and pepper. 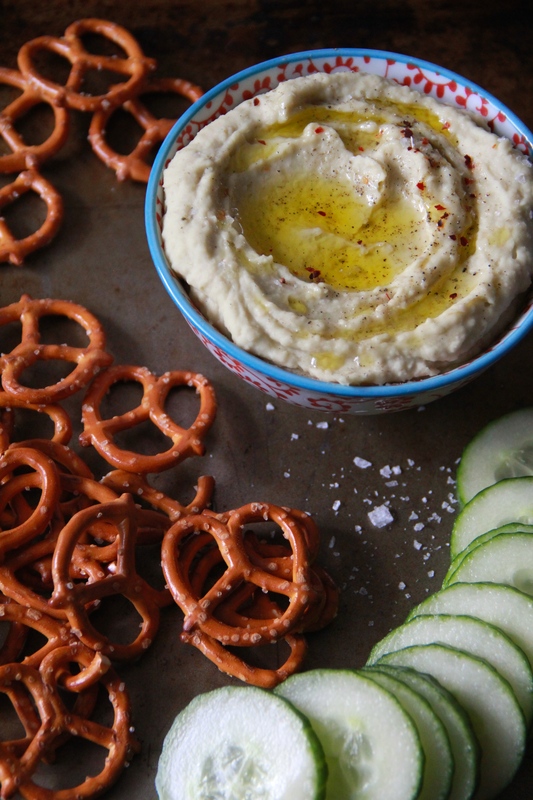 Serve the hummus with extra drizzles of olive oil, crushed red pepper flakes and flaky salt. I love this recipe because I always have a half avocado and no idea what to do with it! I put the first half in a salad, on a sandwich, etc. Next time I will have a plan for that second half 😀 This looks delicious! This looks delicious! And you’re right on about that ikea thing…..
Molly I am obsessed with your blog and with you a little (alot) too. I want to make everything on here and I always LOL at your posts. MISS YOU!! !